Major earthquakes shook Lombok in 2018. On 29th July (6.4 on the scale), 5 th August (6.9) and again on 19th August (6.9). And because one of our schools was damaged heavily we decided to design a special T-shirt. With a drawing that was made by one of the school’s pupils, British graphic designer Jimmy Turrell created an incredible new Face This T-shirt. How did we use the proceeds of the tee? Read on! With this special Face This tee for men and women we raised 15,000 euro. And in in total, we raised Rp470 million rupiah (approx. EUR 30,000). So nearly half of this was raised by us. The other half came from individuals, families, and a number of schools across the world. We couldn’t do this on our own. Thanks to Australian actress Teresa Palmer and Dutch celebrities like Geraldine Kemper, Katja Schuurman, Joshua Nolet (Chef’Special), Tess Milne and Shelly Sterk we were able to get the message out. We are so thankful for their support – you can find a full overview of the celebritees over here. Many of the village houses in the Duduk Atas area were destroyed or badly damaged – and people were traumatized. In August-September, we got busy providing emergency assistance in the form of food packages and tarpaulins for emergency shelters. 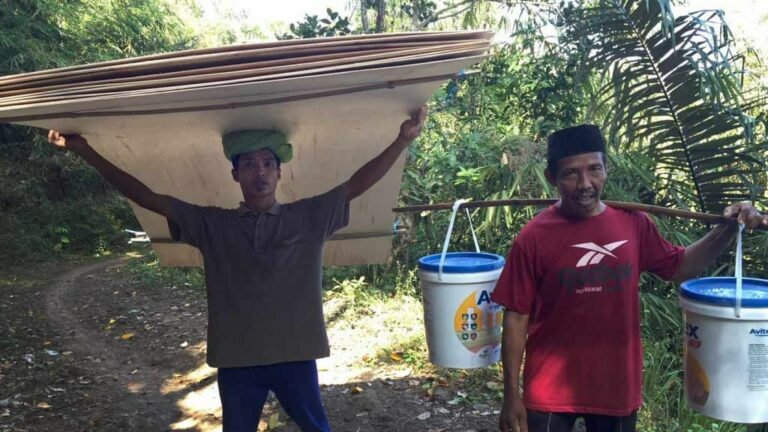 Beginning in October, we focussed our efforts more on helping with recovery, especially (1) repairs and improvements to the school (SDN3 Batu Layar) and (2) materials and labour for construction of semi-permanent houses or repairs to existing houses. In the aftermath of the first earthquakes, we provided meal packages to traumatized and homeless villagers. After coordination with the village administration, we then provided packages of basic foodstuffs to community kitchens set up at various temporary camps and community centres – including in our land in the valley. At the same time we provided tarpaulins to the school and community for temporary shelter. Work was completed in December on 36 homes – or semi-permanent dwellings. For many, the temporary housing turned into more permanent repairs to their old houses. Some dwellings needed to be knocked down – due to extensive damage. Some could be repaired. So the story is one of adapting – using recycled materials, local networks, local expertise, local leadership and local ways of doing things to adapt to the disaster. We have provided the missing element – materials and funds to pay for some labour where needed. The cost was approximately Rp6.5 million (EUR 400) per house. The key is ‘build back better’! We worked with the school and community leaders to repair and refurbish all classrooms and the school surrounds. We have been working with this school and community for many years – so we know them well. The school is built on a steep hill in an area prone to landslips, so it was imperative to complete major repairs before the rains. In addition to fixing the six classrooms, we were able to fix retaining walls, and external stairs, the water storage system and toilet, the library (which was badly damaged) and the early childhood learning space. Final work is now taking place on the early childhood centre. The total cost, including materials, transport (Duduk Atas has no road access so this is a factor) and labour, is Rp125 million (EUR 7,800). Out of disaster comes good! There are still some funds available (approx. Rp 45 million). We plan to use this for a different, but related, purpose. We propose to use the remaining funds to work with the village office, the school, and the community to set up a functioning library with a focus on supporting reading and literacy for children. The idea is to hire a local unemployed graduate to help (1) catalogue the existing books and procure new children’s books (there are some great books available now from NGOs and commercially), (2) furnish, paint and set up the library with proper shelves, desk, comfortable reading chairs/cushions etc. – make it child friendly, (3) perhaps construct an open-sided barugaq to use for routine afternoon reading/book sessions – open to the public, (4) establish a team of community members to run the library and ‘taman baca masyarakat’ (literally, ‘community reading garden’) – using the barugaq and regular sessions with local kids. 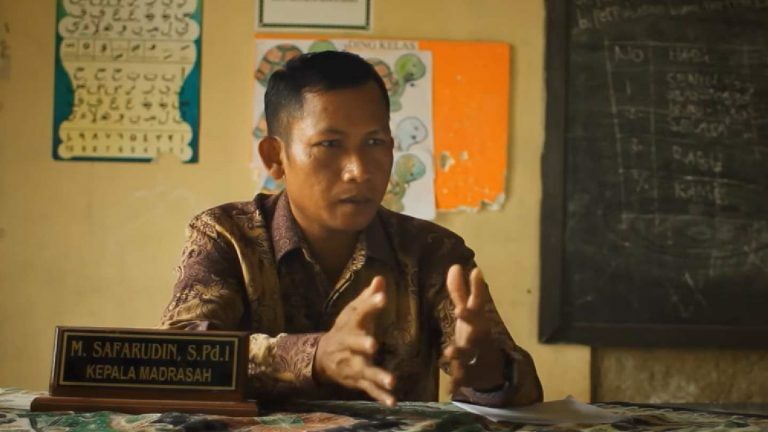 This can all be linked to the school at Duduk Atas with regular book swaps, and involving the teachers (especially early childhood teachers) in the community library activities so they, too, learn how to build a ‘reading culture’ in their school community. The work is nearly complete now. Thanks to your help, teachers and children in the poor community of Duduk Atas were able to get back to school, initially in temporary tent accommodation – and then into the regular classrooms – repaired, refurbished and rebuilt. And 36 families, teachers, staff and community members, were able to get back on their feet; rebuild their homes – or construct semi-permanent dwellings before the monsoon rains. The rains arrived in Lombok in November. The rivers and dams are full. This resulted in some landslides, as dry earth shaken by the repeated earthquakes were loosened in the first big rains of the wet season. But there were no more casualties or major damage in the Duduk Atas community. All the children are now safely housed in semi-permanent or repaired homes. This story is one of collaboration and co-funding. Or Gotong royong as the local people say. Besides our financial support as a major sponsor, and from other sources (including several schools in Indonesia and elsewhere – and many private donations), the villagers and teachers of Duduk Atas and staff of The Studio have also contributed their own time, skills, and resources (timber, rocks, sand etc). So this is also a story of resilience. The villagers, shaken badly and traumatised by the devastating earthquakes, responded with typical smiles and hard work – to get on with the job of rebuilding – better than it was before!